Bidri art is indeed a treat for art collectors and connoisseur’s all across the world. What is Christmas and When Did it Start? 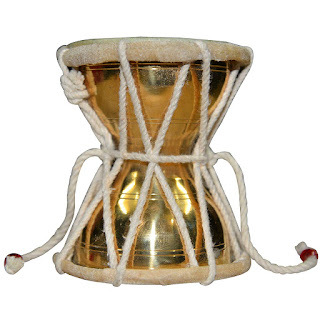 Classical Indian hand percussion Damru is well known folk instrument for drumming in all over India. Damru is mainly made in wood, metal or skull with both ends covered by animal skin (goat skin) crossed tied-up strings or cords made from cotton, leather or jute. Damru is an hour glass shaped drum, typically played with the bare hands, a player wave the instrument by twisting the wrist back and forth. A Damru player adjusts the pitch of the instrument by adjusting the pressure that is applied to these strings. Damro is associated with Hindu God Lord Shiva, it is Lord Shiva favourite musical instrument that is why Damru is also known as a power drum, which invokes spiritual energy. DronaCraft © 2016. All Rights Reserved.